Performance 2.0 Black 12 Piece Set Get your power tools, seasonal decorations, gardening supplies and more organized with the Performance 2.0 Series cabinet system. With durable 24-gauge steel frames and strong double-walled doors, these cabinets are built to last, and they're fully-lockable, so you can rest easy knowing your valuables are safe.Easy-to-grab stainless steel handles give quick access to your items, and a frameless door design provides a clean, contemporary look to your space, with height-adjustable legs to accommodate for uneven garage floors.Flip-up style doors on the Wall Cabinets allow for a wider opening for retrieving paint supplies, and cleaning items, while adjustable steel shelves in the Locker and Base cabinets give you a customizable storage solution, with plenty of room for all your belongings.Durable steel cabinets, great for any space. 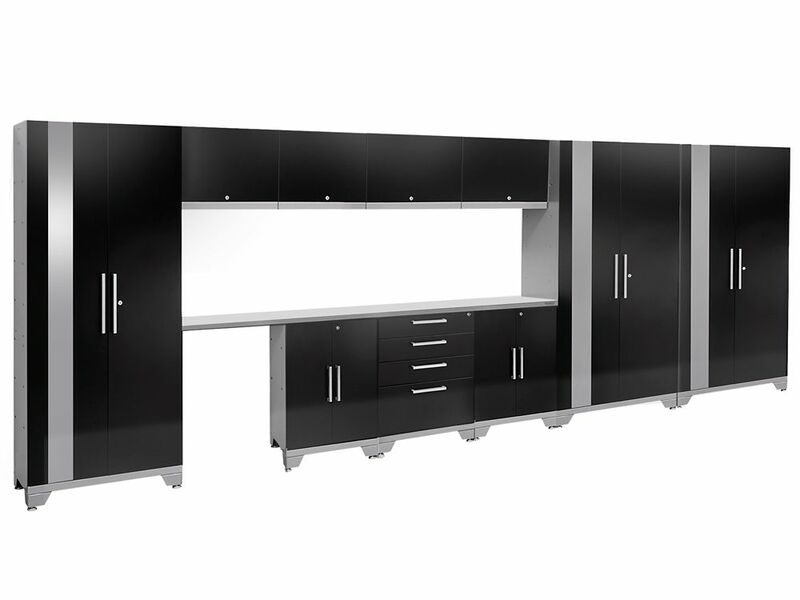 With the Performance 2.0 Series Garage Cabinets, your home just got a lot more functional. Performance 2.0 Black 12 Piece Set is rated 3.0 out of 5 by 1. Rated 3 out of 5 by nutman from Looks great but the steel and assembled product is from China and was delivered damaged. Not by t... Looks great but the steel and assembled product is from China and was delivered damaged. Not by the shipper, but from the warehouse where packaged. I'll give it another shot and see if I have better luck next time? NewAge has come out with a new version of the Performance line at a higher cost. The higher cost must be better steel?